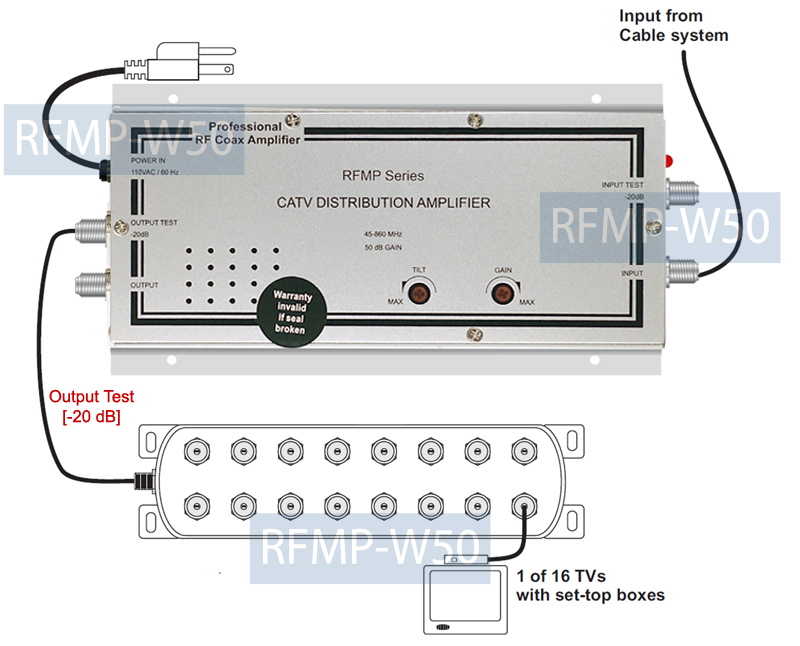 This commercial-grade RF CATV distribution amplifier helps boost the RF TV signal for analog/digital cable TV, CCTV, SMATV, antenna or all other RF modulated TV system with amplification up to 50 dB gain. This high-gain TV signal booster can be used for full range of TV bands for both UHF/VHF and CATV systems when you have long cable TV runs and multiple splitters used in the setup. 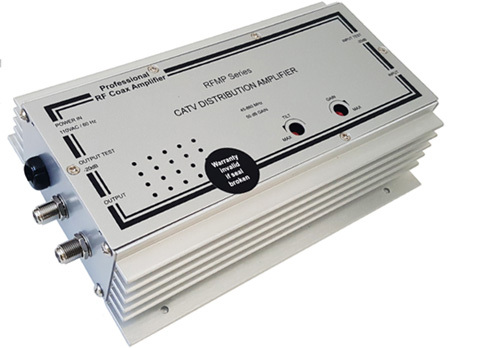 This RFMP-W50 amplifier is the perfect cable or antenna amplifier for large multi-dwelling units (MDU) that require precise RF amplification with gain and slope adjustments for a professional installation. It provides clean, crisp video for large homes or office buildings with long cable runs and many TV outlets where amplifier cascading is required. Featured with adjustable attenuation to reduce overdriving and adjustable tilt compensation to allow large systems to be properly balanced. This unit is featured with high 50 dB gain for RF input signals to compensate the RF TV signal loss and attenuation after long cable transmission. Users can easily extend the cable TV signal for another 2100FT or 650m if RF TV source signals have fair 70 to 75dB strength to start with. So more TVs can be added in large office building or home residence. Also served as a great solution for fixing the problems of noise, snowy picture, interference and weakness after distribution for CATV, Digital TV systems and CCTV systems. The variable gain dial on this amplifier provides an adjustable attenuation control for reducing the possibility of over driving and get best performance. This gain control is very handy for installer to obtain the optimum signal level balancing in installation. Proper gain level can greatly enhance the picture quality with minimum noise. When installer has a large RF TV system to run or multi-transmission by one coaxial cable, this Slope Control function helps installers balance all cable TV signals to be transmitted at same output amplitude for optimal installation. 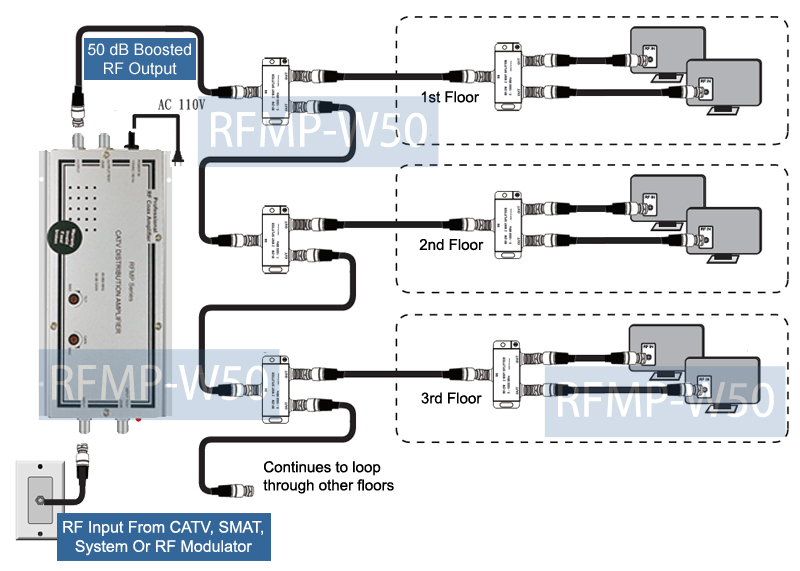 Because the UHF channels will have more loss than VHF channels after long-distance transmission, the 0 to -16 dB compensation provided by this booster can allow large TV coax systems to be properly balanced and mixed with other CATV or existing RF distribution system. This amplifier is featured with robust aluminum die-cast chassis, which provides excellent heat dissipation and long durability. A testing port with -20dB input/output is provided for easy trouble shooting. 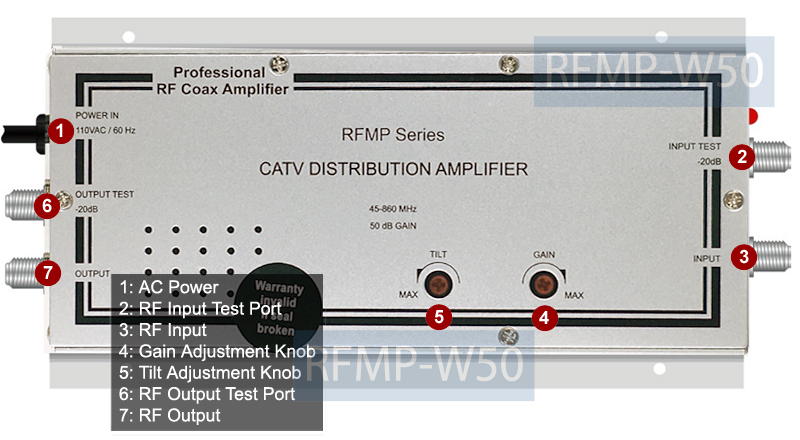 Professional-grade cable TV and antenna signal amplifier with high 50dB output level. Supports TV coax cable signal from cable outlet, cable TV box, antenna, DTV, CCTV DVR, MATV or all other RF modulated TV system. Designed for large multi-dwelling units(MDU) that require precise RF amplification with gain and slope adjustments for a professional installation. High-power amplification to compensate for the attenuations of the passive TV distribution components like cable, taps, splitters and cable outlets. Advanced CATV hybrid circuitry providing extremely low-noise figure and minimum distortion. Adjustable gain control and tilt control allows for easy system balancing. Solution in solving the problems of noise, interference and weakness after distribution. Boost RF coax signal with ease for more than 2100FT or 650m if RF TV source signal has fair 70/75dB strength to start with. Boosts the existing CATV or antenna signal strength for greater distance with minimum loss for more TV distribution. Adjustable gain/attenuation to reduce overdriving. Adjustable tilt compensation to allow large CATV systems to be properly balanced and mixed with other CATV or existing RF distribution system. 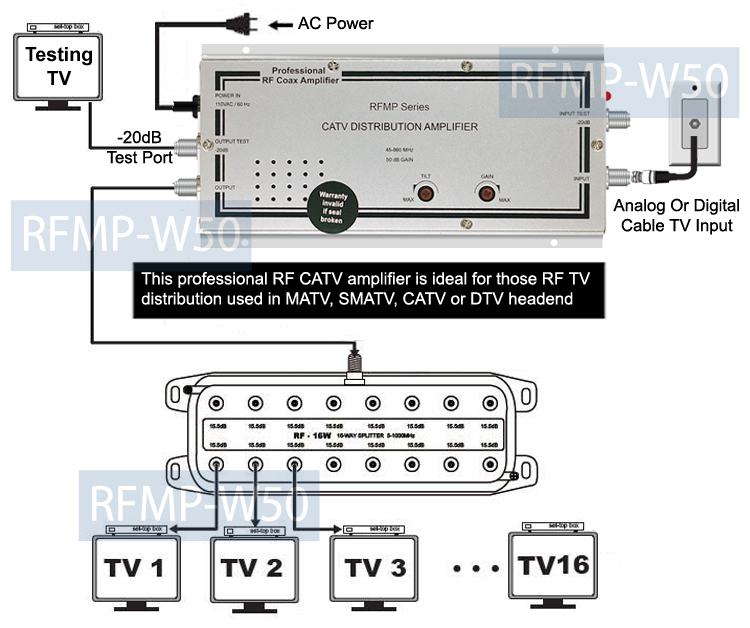 Supports full TV frequency range from 40MHz to 860MHz for analog/digital cable TV, UHF and VHF channels. Anti-Interference module design with advanced noise filer built in. -20 dB Output/Input Test Port is provided for easy trouble shooting. Thunder bolt protection with internal AC fuse built in for high voltage surge events. Aluminum chassis provides excellent heat dissipation and long durability.